Point Pleasant junior Karissa Cochran (24) delivers a pitch during a March 31 softball game against Sissonville in Point Pleasant, W.Va. Cochran earned a first team selection on the 2015 Class AAA all-state softball team for 2015. 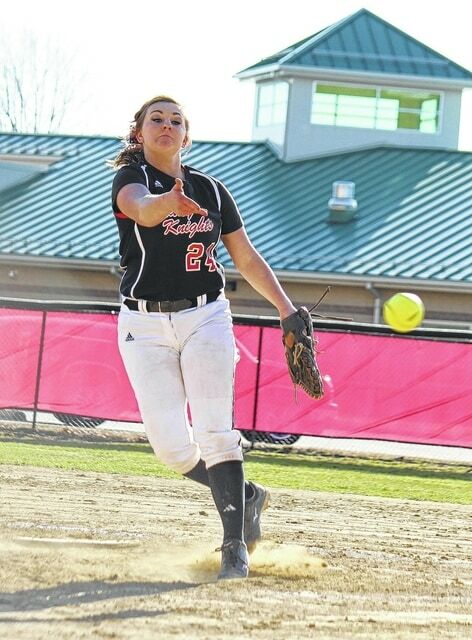 PARKERSBURG, W.Va. — Point Pleasant had only one player selected to the Class AAA all-state softball team for 2015, as voted on by a select panel of members of the West Virginia Sports Writers Association. Junior Karissa Cochran was a first team selection for the Lady Knights as a utility player. Cochran was also a second team selection a year ago. Junior Sabrina Shroades of Musselman was selected as a first team captain as a pitcher, while Lincoln County senior Faith Huffman was the second team captain as a utility selection. Pitchers: Taylor Stocks, Musselman, Jr.; Sabrina Shroades, Musselman, Jr. (Captain); Courtney Rogers, Hurricane, Sr.; Aarron Ward, Logan, Sr.
Infielders: Madi Casto, Hurricane, Sr.; Sarah Barrett, Lincoln County, Jr.; Cassi Sargent, Hurricane, Sr.; Brooke Clark, Shady Spring, Fr. ; Syd Sipple, Huntington High, So. Outfielders: Summer Collins, Logan, Sr.; Jayme Bailey, Hurricane, Fr. ; Olivia Orcutt-Lazo, South Charleston, Jr.
Utility: Kiersten Landers, South Charleston, Fr. ; Rachel Rousseau, University, So. ; Karissa Cochran, Point Pleasant, Jr.; Brooke Jackson, Spring Valley, Jr.
Catchers: Kat Donzella, Wheeling Park, So. ; Brittany Allison, Parkersburg, Sr.
Pitchers: Amanda McDonald, South Charleston, Jr.; Emily Davis, Hurricane, Sr.; Alyssa Harper, Elkins, Jr.; Olivia Canterbury, Cabell Midland, So. Infielders: Paige Swisher, Ripley, Fr. ; Haylee Shires, Greenbrier East, So. ; Ashley Bentley, Musselman, Jr.; Tori White, Lewis County, Jr.; Gracie Donato, Riverside, Fr. Outfielders: Morgan Karnell, Wheeling Park, Sr.; Jazmine Martin, South Charleston, Sr.; Abbi Namath, John Marshall, Sr.
Utility: Erika Williams, Huntington High, Fr. ; Faith Huffman, Lincoln County, Sr. (Captain); Heidi Hormell, Morgantown, So. ; Jordyn Munson, Hedgesville, Jr.
Catchers: Brandi Isaacs, Lincoln County, Sr.; Katie Adams, Hurricane, So. Lindsay Bolyard, Morgantown; Haleigh Christopher, Spring Valley; Jackie Gellner, John Marshall ; Tommi Lunsford, Cabell Midland; Kelly Knuckles, South Charleston; Kelby Hall, University; Darby Petersen, Ripley; Alyssa Blake, John Marshall; Emily Moore, Winfield; Alexis Coalson, Shady Spring; Jenna Marsh, Cabell Midland; Haley Caldwell, Spring Valley; Amber Null, Hurricane; Camryn Michallas, Huntington High; Maddie Hebb, Hurricane; Megan Tully, Lincoln County; Jordan Hart, Elkins; Alexis Rumbach, Lewis County; Nichole Brown, Nitro; Katie Legg, Winfield; Kendal Marshall, Riverside; Kati Kelley, Cabell Midland; Jenna Witt, Jefferson; Kelcie Jenkins, Musselman; Mikayla Willingham, Washington; Cierra Funke, Hampshire; Morgan Hylton, Shady Spring; Hannah Johnson, Oak Hill. Jade Spurlock, Spring Valley; Kelley Bare, South Charleston; Tori Adkins, Cabell Midland; Bre Clark, Huntington High; Cassidy Newbrough, Parkersburg; Jocelyn Amburgy, St. Albans; Conner Assif, University; Taylor Scott, Spring Valley; Hannah Pullen, Riverside; Madi Howell, Huntington High; Baylee Hilling, Parkersburg; Lindsey Cox, Parkersburg South; Sara Burky, Elkins; Ashley Burger, Spring Mills; Morgan Knicely, Buckhannon-Upshur; Taylor Pingley, Elkins; Torie Riffle, Lewis County; Shadie Suder, Buckhannon-Upshur; Paige Scruggs, Hurricane; Whitney McKay, Lincoln County; Emily Bostic, South Charleston; Kenna Markham, Winfield; Lauren Pauley, Riverside; Haley Fischer, Musselman; Courtney Gordon, Spring Mills; Lauren Lanham, Hedgesville; Darian Vines, Shady Spring; Tiffany Gray, Oak Hill; Bella Coles, Greenbrier East; Sha’lyn Lawson, Woodrow Wilson.